Rich black finish catering to a modern look. Stylish electric blue finish. 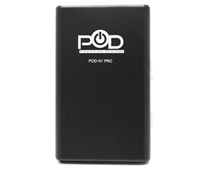 The POD-X1 Pro automotive jump starter and power pack ideal for 12V gasoline engine cars, boats, motorcycles and motorsports vehicles, and for charging electronic devices.